From the Stroganovs to the GULAG, the Russian North boasts a wealth of architectural history. As early as the 16th century, the Northern Dvina River served as an essential link in Russia’s trade with Europe. Through the port of Arkhangelsk, the wealth of the Russian north made its way over the frigid White Sea to the Atlantic Ocean, while English and Dutch merchants made their way south to Moscow by the same route. The strategic role of the Northern Dvina was enhanced by its tributaries, of which the most important was the Vychegda, which meets the Dvina some 375 miles upriver from Arkhangelsk. Russian settlements near the rivers’ confluence probably arose in the 14th century with support from the ancient commercial center of Novgorod. Much of the region’s wealth derived from fur pelts and salt. The Stroganovs, who arrived from the far north by the middle of the 16th century, established outposts near this meeting of two major routes: north via the Dvina to the White Sea and east via the Vychegda to the Ural Mountains. Ivan IV (the Terrible) allowed Stroganov to extract resources from limitless areas of the Urals and Siberia, in return for which the domains of the tsar were expanded eastward at minimal state expense. The center of the Stroganov “empire” was Solvychegodsk, located on the north bank of the Vychegda River not far from the Dvina. Its name means "salt of the Vychegda," and the area is indeed dotted with salt springs, as well as the small brackish Usol River and a salt lake, the Solonikha. To get to Solvychegodsk take the regular train from Moscow or St. Petersburg following to Vorkuta or Syktyvkar and take off in Solvychegorsk. Although now a sleepy resort with a population of some 2,500, Solvychegodsk bustled in the late medieval period. The enormous wealth created by the salt monopoly allowed the Stroganovs to build on this remote site two of the most elaborate examples of religious architecture and art in all Russia. The patriarch of the dynasty, Anika (Ioannikii) Stroganov (1497-1570), began the lavish Stroganov patronage of the arts. His greatest contribution is the Annunciation Cathedral, begun in 1560, completed in the early 1570s and consecrated in 1584. Its idiosyncratic design has only two interior piers, yet it displays the five cupolas usual for large 16th-century churches. The structure originally culminated in arched gables whose outlines are still visible beneath a four-sloped 18th-century roof. In 1819-26 a bell tower at the northwest corner was rebuilt in an oversized neoclassical form. In the summer of 1600, the interior walls of the Annunciation Cathedral were painted with frescoes drawn primarily from the miracles of Christ and the life of Mary. The frescoes were subsequently “renovated” in the 18th and 19th centuries, particularly after a devastating fire in 1819. Even in their later form, the frescoes create an extraordinary impression. A restoration effort ongoing since the 1970s has uncovered vivid original frescoes of the Last Judgement on the west wall. A number of remarkable frescoes have also been preserved in the apse, which contains the main altar. The centerpiece of the Annunciation Cathedral is a tall five-tiered icon screen, first installed by the end of the 1570s. Its present form dates from the 1690s, although the gilded Royal Gate leading to the altar was donated by the Stroganovs at the beginning of the 17th century. The florid Stroganov style culminated in Solvychegodsk with the late 17th-century cathedral at the Monastery of the Presentation of the Virgin. Its patron, Grigory Stroganov, achieved a dominant position in the Stroganov mercantile empire and soon figured prominently in the reign of Peter the Great. In 1688, he commissioned a new church to replace a wooden one at the monastery, which was founded in 1565 as part of the Stroganov compound. Although the cathedral was not consecrated until 1712, chapels on the ground level were functioning by 1691, and basic construction was completed by 1693. The Presentation Cathedral is distinctive for many reasons, not the least of which is the carved limestone decoration on the brick facades, also ornamented with polychrome tiles. During the 18th century the gallery, originally an open terrace, was enclosed in a brick arcade with an intricate limestone cornice, now partially obscured. The soaring interior of the Presentation Cathedral is framed by a vaulting system of paired arches that support the large structure and its five cupolas with no free-standing piers. The effect is one of bright spaciousness, intensified by the lack of frescoes. All attention is focused on the intricately carved seven-tiered icon screen, created by Grigory Ivanov in 1693. The cathedral icons were painted on canvas (instead of treated boards) in a western style by a Stroganov painter, Stepan Narykov. As new trading routes led to a decline in its significance in the 18th and 19th centuries, Solvychegodsk became a small resort, known for its mineral waters and springs. At the beginning of the 19th century there was still sufficient commercial activity for the Pankov merchant family to build a grand neoclassical mansion. Solvychegodsk also became a place of tsarist exile. The local Museum of Political Exile includes a log house where Stalin spent one of his northern exiles. The Soviet period inflicted much damage on the town’s cultural heritage. Of 12 brick churches at the beginning of the 20th century, eight were destroyed and two others left in ruined state. But the Stroganov churches survived in their monumental glory. The Annunciation Cathedral became an excellent museum, while the Presentation Cathedral is used for worship by the local parish. The regional administrative center is the much newer town of Kotlas (population 60,000), located on the opposite (south) bank of the Vychegda at its confluence with the Dvina. Although Kotlas is mentioned on maps as early as the 17th century, it achieved formal town status only in 1917. The completion of a railroad from the Urals city of Perm made Kotlas a transportation nexus in the late 1890s. Passengers and freight transferred from the rail terminus to river steamers that plied the Dvina. During the 1930s and early 1940s the Kotlas rail hub grew exponentially. Track was laid west to Konosha (on the mainline to Arkhangelsk), and another line was built northeast to Pechora and the coal mines of Vorkuta, which played a critical role in supplying Soviet industry during World War II. Both the Vorkuta line and the coal mines were notorious within the GULAG system, and Kotlas served as a transit point for thousands of exiles and prisoners. The town now has a memorial to victims of political repression. In addition to its importance as a rail center, Kotlas has recently witnessed a growth in tourism. 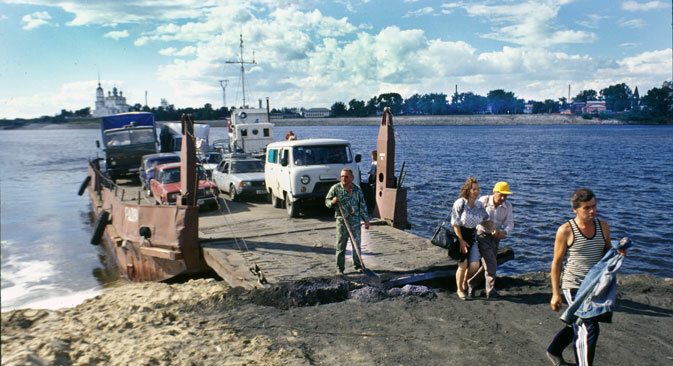 Summer cruises depart from the river terminal, and the opening of a highway bridge across the Dvina in 2001 has facilitated automobile travel throughout the area, including to the tourist destination of Veliky Ustiug. Getting across the Vychegda to Solvychegodsk still requires a ferry during the summer (for both vehicles and pedestrians), but that can be a charming experience in itself.